"The Mummy, meets Relic, meets Alien in this scary action driven horror thriller." Action adventure horror set in the Amazon jungle, abaord a cargo vessel on the high seas and London, England. Concealed in a remote area of the Amazon jungle is something the Mayans thought so dangerous they built a secret prison to entomb it. It remained undiscovered for centuries. When a maverick archaeologist hears rumours of a mysterious lost city, he heads into the Amazon jungle, determined to find it. He soon learns that some things are best left unfound. The dangerous past the Mayans tried so hard to bury, is about to become our terrifying future. When an archaeologist stumbles across a mysterious Mayan city in a remote part of the Amazon jungle, he informs the British museum funding his expedition of the discovery.When fellow archaeologist, Greyson Bradshaw, receives news of the discovery, he jumps at the chance to travel to the Amazon jungle to collect artifacts for the forthcoming Mayan exhibition he is arranging. When the two archaeologists explore the city’s subterranean levels, they enter Xibalba, the Mayan underworld. In a secret chamber they discover something hidden away for centuries; a sarcophagus. Realizing its potential as a centerpiece for his exhibition, Greyson transports the sarcophagus and other artifacts back to England. The past is about to come alive. "Hammott is fast becoming the master of monster horror. Read his Ice Rift or Horror Island books and you'll know what I mean. Fantastic escapism." ""Fast paced and exciting without being slowed down by pretentious prose. Perfect for fans of Preston & Child, James Rollins, Matthew Reilly, Daniel Silva, Steve Berry and exciting alien creature horror thrillers." "The author has such a creative mind it's scary. The monsters he brings alive in his books are simply terrifying. 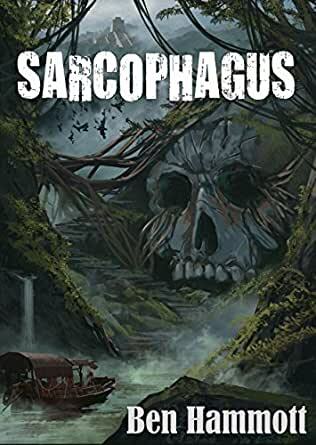 Add atmospheric locations,characters you root for, racked up tension, a thrilling plot that forbids you to stop reading, and you have Sarcophagus." Like the style of writing, the action and of course, the monsters! The IceRift trilogy was my intro to Hammott, Sarcophagus my second foray. Horror Island is next lol.. I always love a good exploration book with plenty of details about ancient civilizations and cultures. This was merely a chase the creature down book. I wanted to know where it came from, why the maya were the ones to jail it, what it’s motivations were. No cool history about gods or demons or aliens etc. this was about as exciting as reading about a car chase. I skipped to the end just to end it. Even though I already predicted the ending. No twist there. It was “ok” up until it got towards the end. I completely lose interest in a book when there are clear factual errors. For example, book is set in 1924 but then at the end talks about “fiberglass hulled boats” and setting off “car alarms”. Stuff like that totally kills any chance of picturing the story in my “mind’s eye” as I read the book. Rarely have I been so fascinated and scared and entertained by a book. Don't miss out on a great read! Cringe inducing dialogue that "mansplains" everything to the reader. The pacing is garbage, it takes forever to get to any point of interest, and the finale is just as dull as it's opening. Absolute avoid unless you enjoy awful writing with no suspense.